Hello everyone! Today I have a wonderful Scripture card to share with you from the newly released Our Daily Bread designs Scripture Collection 4 and the Vine Borders set. I stamped with Memento Ink on GPW and used the Stamp- a- ma- jig to center the verse in the frame. I lightly colored in a bit of the vine border with olive green. I cut panel with SB Long Scalloped Rectangles, then matted with brushed silver and old olive. My textured embossing is Sizzix, and I cut the lower edge with an EK Success Punch. I duplicated that layer with an olive layer and then matted on silver, and on a base of white. The Fleur de lis is Spellbinders with tiny pearls added. I used a textured silver ribbon then covered that with a sheer ribbon and tied on a little charm that was a RAK from a dear friend. I love this verse. What a comfort... the world around us may be in a terrible state, but our assurance in our God, who never changes, and we can rest in that. " My soul finds rest in God alone, my salvation comes from Him. He alone is my Rock and my Salvation; He is my fortress, I will never be shaken." I am away from my computer visiting with family, and this post is on auto pilot. I will be back later with some new things to share with you. Have a blessed day and thanks so much for stopping! I love knowing you were here! Grace this is gorgeous, LOVE this layout!!! Beautiful work! i was here and have seen your beautyful card. Elegant & beautiful, Grace ! Am oh, so happy that verse made the Scripture Collection ! What a beautiful card. I am trying to get more into card making. You have given me inspiration! Beautifully done! You are a comfort and blessing to me. Grace - your card is gorgeous!!! I'm with you...this Psalm is very comforting!!! With losing our step-father recently I'm trusting more than ever in our Lord!!! He is my rock and my salvation!!! Such an elegant and comforting card - just beautiful! Thanks so much for playing at Practical Scrappers. I`ve truly enjoyed my visit to your blog, Grace...your work is amazing and so beautiful!! It is a very beautiful card. This is beautiful Grace!! I just love the clean white with all your elegant touches and embossing!! Very striking my friend!! What a lovely elegant card! I love that Psalm. "He is my fortress..."
The silver is so beautiful, and I love your embossing...it adds to the elegance. Your new picture is beautiful! The outside matches the inside...when it comes to you! This is so elegant. Thanks for sharing it with us at TG this week. This is so pretty!! I just love all the dies and the embossing! Beautiful! Beautiful card Grace.. I love the embossing. It really adds so much texture to your card.. Great job.. Have a super weekend..Hope we get some warm sunshine. Gorgeous card Grace!! Love the embossed bg, the scallops, and that ribbon is gorgeous!!! Thanks for playing along with us over at Practical Scrappers!! Well as you know we have been pretty busy around here painting , but I wanted to take a break and stop and visit your blog as always you amaze me with your beautiful cards. So clean, crips, and so elegant!! Love the fluer de lis'!! 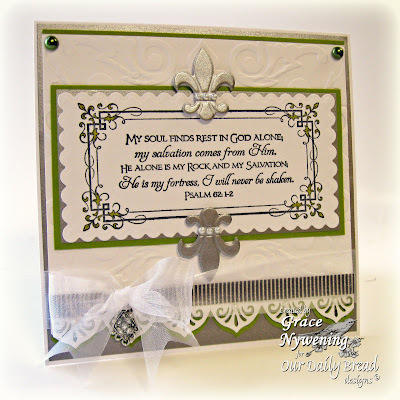 beautiful, inspiring card, Grace...the fleur de lis are GORGEOUS!! GORGEOUS in every detail!!! WOW! What a stunning card!!! Just beautiful, thanks so much for playing along with HFOS.